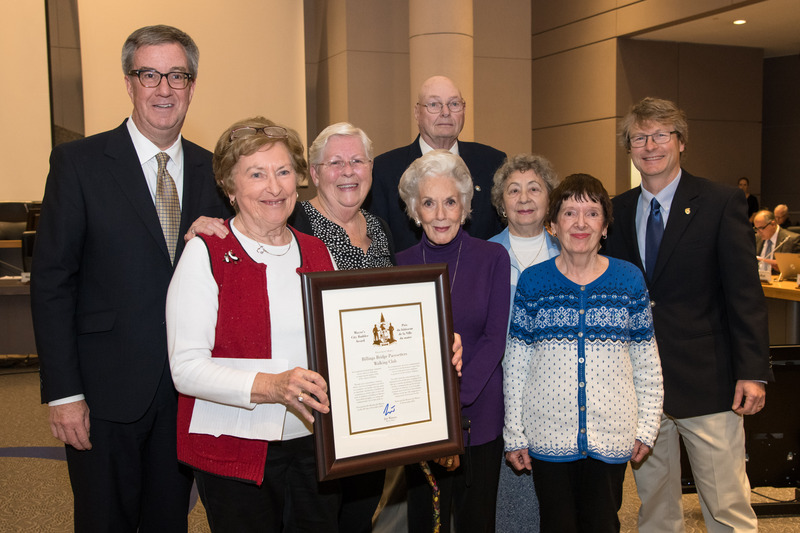 Mayor Jim Watson presented the Mayor’s City Builder Award today to the Billings Bridge Pacesetters Walking Club, with Capital Ward Councillor David Chernushenko. The Billings Bridge Pacesetters Walking Club was recognized for its contributions to osteoarthritis research and for 25 years of community support. The Billings Bridge Pacesetters Walking Club is a social walking and knitting club that produces blankets, scarves, mittens and hats for seniors and children. The club started 25 years ago at the Billings Bridge Shopping Centre as a way to promote social interaction and reduce isolation among seniors. The group keeps active through walking and knitting, and donates much of its knitting to those in need. Wool blankets are made for the Children’s Hospital of Eastern Ontario and local retirement residences. Members also knit hats, scarves and mittens for clients of the Snowsuit Fund. The Billings Bridge Pacesetters Walking Club has supported the University of Ottawa on studies of the health benefits of walking and knitting for older individuals with osteoarthritis.